"Tom: We both want to send you our deepest sympathy for your..."
"Tom, Marilyn and family May the love of friends and family..."
"Tom and Family: Sandy and I would like to express our..."
Loretta Marie Culkin, 94, a lifelong resident of Scranton, died Saturday evening at Moses Taylor Hospital. 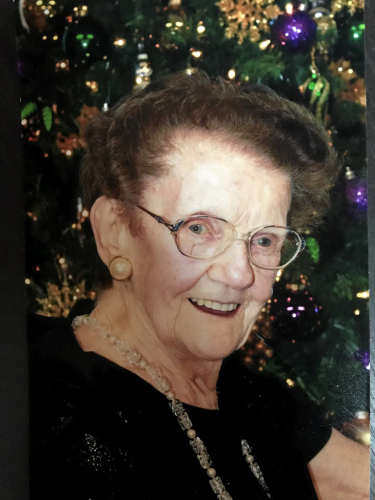 Born and raised in the Nativity section of Scranton, the daughter of the late William and Bridget O'Hora Hines, she was a member of St. John Neumann Parish. Loretta was most recognizable by her flaming red hair and her friendly "Irish Eyes" smile. She worked hard all her life as a nurse's aide taking care of numerous patients. She was a selfless person, never tiring in her giving to others, she would give anyone the shirt off her back. She believed in the luck of the Irish, despite having experienced little of it herself. She was an avid and expert bingo player and loved to take her chances with the lottery. Surviving are two sons, Thomas Culkin and his wife, Marilyn; and Patrick Culkin; a sister, Theresa Wolfe, all of Scranton; five granddaughters, Amy Ostrowski and her husband, Jeffrey; Erin Tansley; Bridget Judge and her husband, Shawn; Meghan Gable and her husband, Jonathan; Jennifer Heffron and her husband, Mike; great-grandchildren, Jacob and Nicholas Ostrowski, Emily Tansley, Lily Judge, Lucy and Charley Gable, Alyssa and Henry Heffron; several nieces and nephews. She was also preceded in death by three brothers, John, William and Joseph Hines; and two sisters, Ann McDonough and Mary Ganz. The funeral will be Wednesday at 9 a.m. from the Miller Bean Funeral Home Inc. 436 Cedar Ave., Scranton, with Mass of Christian Burial at 9:30 in St. John Neumann Parish, Nativity of Our Lord Church, 633 Orchard St., Scranton. Interment will follow in the Cathedral Cemetery, Scranton. Friends may call on Tuesday from 4 to 7 p.m. in the funeral home. Memorial contributions may be made in her memory to the Little Sisters of the Poor, Holy Family Residence, 2500 Adams Ave., Scranton, PA 18509-1515. Please visit the funeral home website to leave an online condolence.